Cinco de Mayo is this Saturday, and it's kinda a BIG DEAL at our house. Since I spent most of my life in Arizona, I grew up with a lot of Mexican neighbors, and let me tell you, they know how to throw a party! Festivities last all day and long into the night, and it's just a fantastic holiday! Plus, my sweet Danny Mac was born on Cinco de Mayo, so we get double celebrations. WIN WIN. Download comes as an 8.5x11 digital PDF, and are super easy to use. If you need extra help, please check out our printing tips. 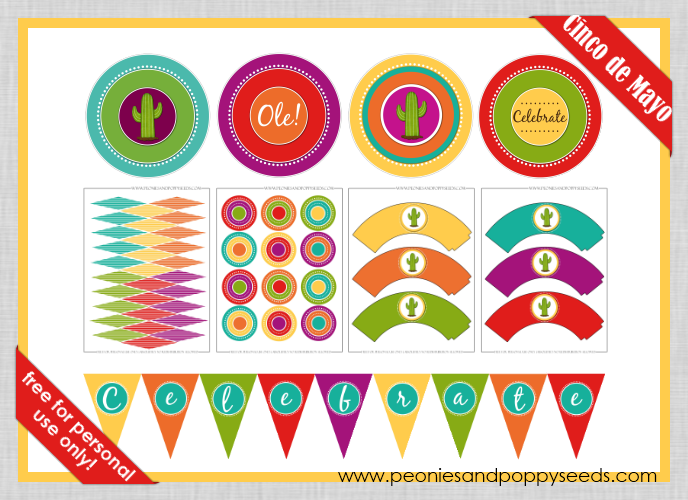 Remember - Peonies & Poppyseeds printables are for personal, private, non-commercial printed use only. Absolutely no redistribution allowed. If you want to share our stuff, please send people back to our site, especially for the downloads. Thanks guys!